Perfectly Popping up!! 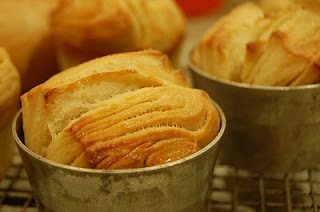 This is buttery layered bread, kind of croissant and danish. You can see layer of crumb. 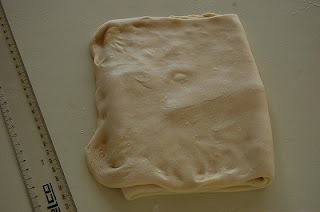 The dough is popping up from the tin, because it is yeasted pastry. 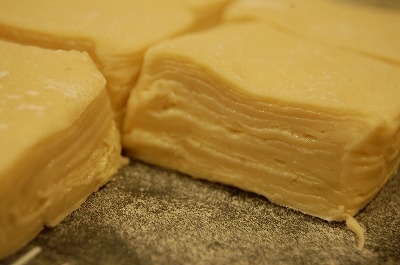 I made buttery layer on sidewise. 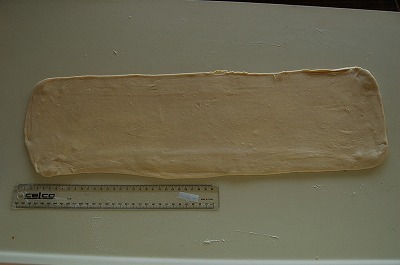 To make croissant or danish pastry dough, I need cold butter and pound it, make 20cm square to laminate. That makes thin, flaky crust and layer. 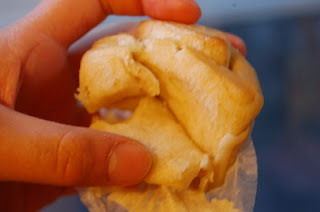 But this recipe, I use softend butter and just apply on the dough, and fold it. 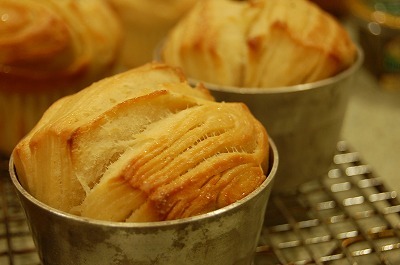 That makes layer, but not as flaky as croissant. 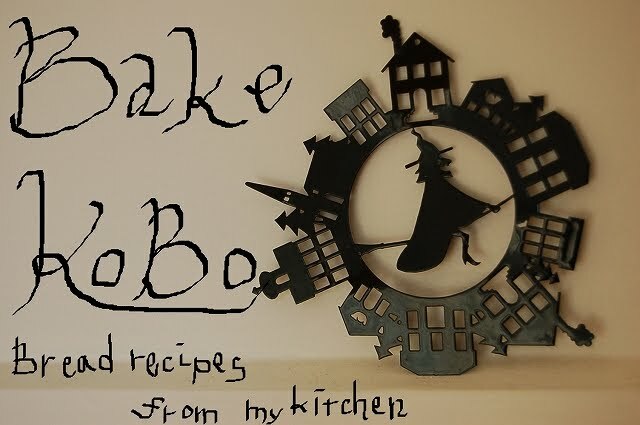 I want to make this recipe easy, and want anyone to try. Or I am just too lazy. 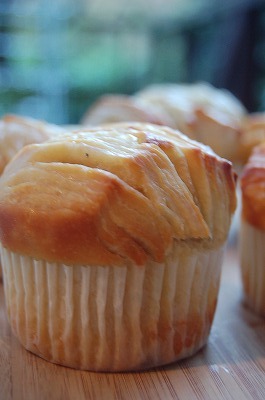 So I call it Lazy Butter Flaky. Sweet and rich buttery soft crumb. 1. In the mixer or bread machine, combine the all dough ingredients. Mix it 15 minute. It can be stretched a paper thin“windowpane. 2. 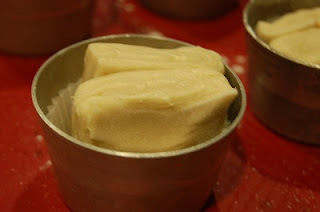 Wrap it up with plastic wrap, and ferment at room temprature for 40min. Then Place it in the fridge for 24hours till it becomes double size more. 3. Before laminating, soften the butter with spatura at room temprature to make it easy for applying on the dough. 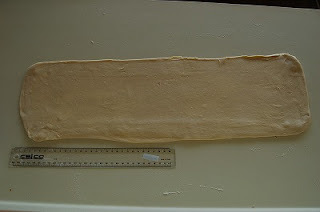 Spread the dough to 60cm x 25cm with a rolling pin. 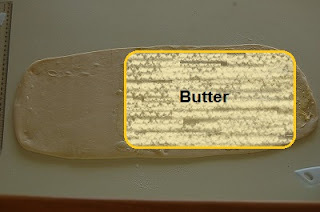 Apply the softened butter on 2/3 of the dough. Fold 1/3 left part of the dough and 1/3 right part as well . 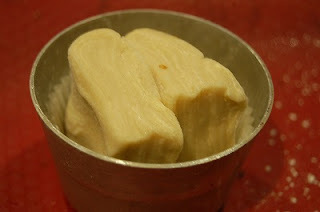 Seal it tightly, not to butter come out. 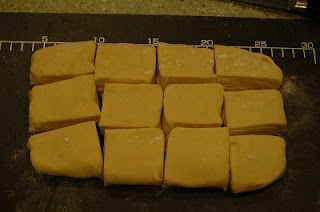 Retate 90 degree, and pound it with the rolling pin. spread it 50cm x 25cm with care. Fold 1/3 left part of the dough and 1/3 right part as well. And Repeat Pounding with the rolling pin. 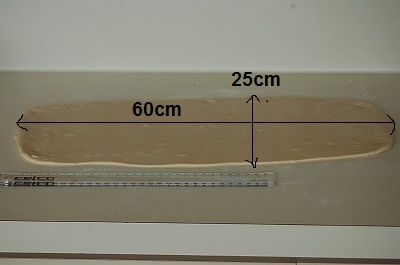 Then spread 40cm x 20cm. Fold it 1/3 as well. Retate 90 degree. 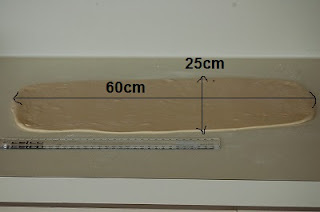 It becomes 20cm x 12cm. 5. Wrap it up with plastic wrap, place it into the fridge for 1 hour. Meanwhile, coat oil on the muffin cup, and place muffin cup paper if you have. 6. 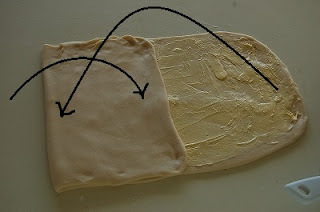 Transfer the dough, on the floured chopping board. Cut it off into 12 pieces, 3cm x 5cm each. 7. Combine 2 pieces, and put it into the muffin cup. Show the nice layered part on up-side. 8. At cool place, place it for 1 - 2 hours with moisture, till the dough come out or reach the edge of the tin. 9. Reheat the oven at 190℃. Apply egg wash on the surface. Splinkle sugar. 10. 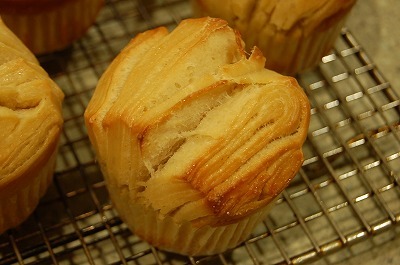 Bake it 190℃ for 15 - 18 minutes till it become golden color. 11. Cool them on the wire rack. Take them out from the tins, once it get cool down. Butter ... those are beautiful. 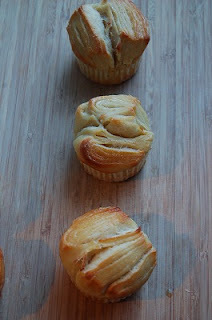 I have decided to make these tomorrow and I was just wondering how many eggs is 30g (and what size). Thanks! 1 egg is about 50g. 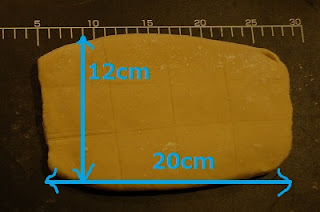 30g for the dough, and left of it could be egg wash. Thank you so much Makoto! I actually haven't had a chance to make them yet but I have one more quick question, I just wanted to confirm that you used active dry yeast because normally you have to proof it first. It isn't dry instant yeast is it? Sorry for all the questions :) Thanks again! i usually use instant dried yeast. i just put the dried yeast with all ingredients when i knead it. because the dried yeast i use of instruction said i dont need to proof it at first. it depends on what kind of dried yeast you use.